Abuse Counseling & Treatment, Inc.
Art connoisseurs share an artful delight in the Arts for ACT Gallery located in historic downtown Fort Myers, in the front of the Arcade Building. It is a pace-setting, award winning and 100% non-profit gallery owned and operated by Abuse Counseling and Treatment, Inc., a non-profit agency that provides shelter and support services for victims of domestic violence, sexual assault and human trafficking. The gallery is devoted to representing the distinctive and extraordinaire by offering premium quality works of art. Housed in what was once the Sydney Davis Men’s Store, circa 1960’s, the art lover walks through the gallery’s inviting glass façade into over 2100 square feet of gallery space divided into smaller areas, each with its own personality. Showcasing the art of the two featured artists monthly, in the front gallery and the white gallery, reminiscent of galleries in SoHo, has 12-foot high ceilings, distressed brick walls, and warm wooden floors. This gallery changes monthly. Hosting opening receptions free to the general public for our featured artists every month at the first Friday, Fort Myers Art Walk. It is a great opportunity to meet the gallery’s featured artists, have a glass of wine, and engage in lively artful discussions. As you peruse the other galleries, the rooms range from formal to funky and are as diverse as the artwork. Being a truly eclectic gallery the bevy of 75 artists includes four-time gold medalist Olympic discus winner, the late, abstract artist Al Oerter; Cape Coral marine watercolorist David Belling; and the abstract expressionism of international artist Cheryl Fausel and other local artists. The ever-colorful Florida art of Mel Meo and Teresa Kostrabala, and beautiful jewelry of several local artists are popular draws. The work may be purchased for a few dollars to several thousand. 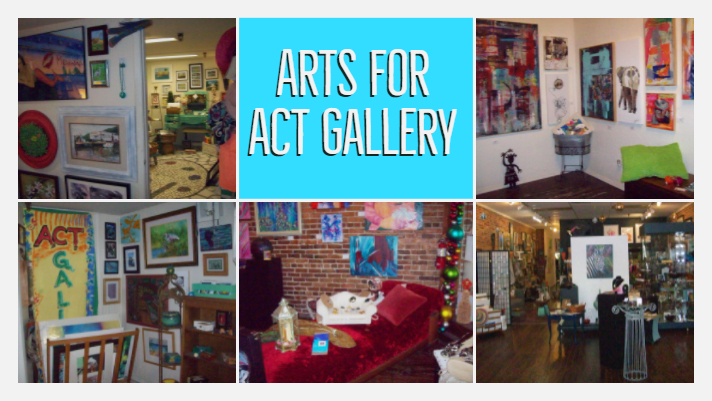 Arts for ACT Gallery provides a quality, contemporary exhibition gallery featuring the original art, limited edition prints, giclees, hand-crafted fine crafts, recycled clothing, silver and glass bead jewelry, gourd art, raku, clay, and art cards. It is a “must see” destination for all art lovers and collectors providing a unique opportunity for everyone to learn and enjoy art. Rent Art from our Gallery for your business - Give your office a whole new look! The Boutique now offers clothing, hand bags, shoes, jewelry, vintage and more. New items weekly. Come in and see what treasure you can't live without!